Hershey's Kiss Peanut Butter Cookies have been around since 1957 when they were a contender in the 1957 Pillsbury Bake-Off and officially dubbed Peanut Butter Blossoms. We've also got the original recipe for Peanut Butter Blossoms. As a home baker, sometimes it's nice to have quick and easy shortcut recipes that deliver just like homemade results in less time with fewer ingredients. These two recipes for chocolate kiss peanut butter cookies are great examples of just how deliciously satisfying quick-and-easy shortcut cookie recipes can be! The first kiss cookies recipe uses baking mix and sweetened condensed milk and requires a total of just six ingredients. The second kiss cookies recipe uses peanut butter cookie mix in place of from scratch peanut butter cookie dough. These easy cookie recipes are a great alternative when time is at a premium and especially fun to mix up with the kids! Remember that it's always best to bake peanut butter kiss cookies in the middle of the oven, one cookie sheet at a time, and be sure that cookie sheets are cool before baking the next batch. You can speed up cooling the cookie sheets by running the back side under cold water between batches! Be sure to use sweetened condensed milk for this cookie recipe—not evaporated milk. Heat oven to 375F degrees. Line cookie sheets with parchment paper or silicone baking mats for easiest cleanup and best results. Alternatively use ungreased cookie sheets. In a large bowl, beat condensed milk and peanut butter with electric mixer on medium speed until well blended. Stir in Bisquick baking mix and vanilla until well blended. Shape dough in 48 (1 1/4-inch) balls. Place sugar into a small bowl and dip the top of each ball into sugar. Place balls on ungreased or parchment paper lined cookie sheets, about 2 inches apart. Cool 2 to 3 minutes on the cookie sheet and then transfer cookies with a spatula to a wire rack to cool completely. This recipe yields about 48 Peanut Butter Kiss Cookies. This quick and easy recipe for Peanut Butter Blossom Cookies is adapted from The Betty Crocker Christmas Cookies magazine, No. 246. Preheat your oven to 375F degrees. Line cookie sheets with parchment paper or silicone baking mats for easiest cleanup and best results. Alternatively use ungreased cookie sheets. In a medium bowl, stir together the cookie mix, oil, water and egg until dough forms. Shape dough into 36 (1-inch) balls and roll in sugar. Place cookie dough balls 2 inches apart on ungreased cookie sheets. Transfer the cookies with a spatula to wire racks to cool completely, about 20 to 30 minutes. This recipe yields about 36 Hershey Kiss Peanut Butter Cookies. 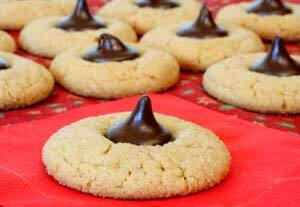 This quick and easy recipe for Peanut Butter Blossom Cookies is adapted from Betty Crocker.